This is an aerial shot from a plane leaving Vancouver on its way to Toronto in July 2007. I had to do quite a bit of work to edit the original – removing the mist that bedevils aerial photos, and correcting the colour, as well as adjusting the frame. Note that I have left the horizon tilted. I usually straighten that but in this case the plane is climbing steeply and turning eastwards. The plane leaving Vancouver took off over the Strait of Georgia, westwards, into the prevailing wind then turned towards the east. The delta of the Fraser River is under threat from industrialisation. It is some of the most fertile soil in British Columbia, and one of the few places where vegetables can be grown. The river is still one of the most important ecosystems in the province with the remaining salmon runs threatened both by urban sprawl and climate change. Add to that the determination of the port to expand its activities – especially for the export of fossil fuels – and the storage of containers, which mostly come into the port loaded but have very much less utility for our exports, and we face a huge challenge. I was very surprised to read in the original challenge “the current growing louder and faster before it spilled into the sea” which is exactly the opposite of what happens in this river delta – and almost certainly every other. The river’s current is much faster inland, where it rushes through the Fraser Canyon. The restriction of Hell’s Gate was one of the greatest challenges facing the Europeans when they started to exploit this part of the world. In building the Canadian National Railway they succeeded in blocking the river with their explosives, and the indigenous people carried the salmon upstream in baskets to help ensure the continuation of the species. The river turns westward at Hope and, as the valley widens, slows and begins to meander. The amount of silt that the water can carry drops as it slows, building the gravel beds that the gold prospectors pounced on, and the rich soils of what became farmland. In its natural state as the valley bottom opens up and flattens out the river would constantly move north and south seeking the sea between the mud banks and silt layers. We have of course put a stop to that with dykes and embankments to prevent flooding – that is actually the natural state – and constant dredging of the shipping channel to keep it open and, contentiously, to allow for larger ships. This “photograph that signifies transitions and change to you” is one that I have used a lot on this blog as part of the campaign that challenges the present plans to expand the port and build a new, huge bridge at the leftmost edge of this picture, where the soil of the river banks is 2,000m or more of silts and sands, prone to liquefaction in the case of earthquakes (another imminent threat in this region) let alone the damage to Pacific flyway, the eelgrass beds, the habitat of many sensitive life forms and, of course, Burns Bog. You can read more about these issues in both this blog and at Fraser Voices. And, by the way, the name of the municipality in most of this picture is Delta. There is a lot wrong with the present BC government’s obsession with establishing an LNG industry. It is, of course, based on fracking – which has been creating earthquakes in BC, a place which, you might think, has quite enough of an earthquake risk already. We also know that the industry has been understating the release of methane from fracking – and that is far more damaging greenhouse gas than carbon dioxide. It is also the case that the costs of producing and storing power from wind and solar sources have been dropping rapidly – far faster than any other power producing source anticipated. That means that whole idea that there is a need for some kind of intermediate step between phasing out coal and switching to 100% renewables is redundant. The siting of LNG plants has also been one of significant controversy, mainly because of sensitive ecological issues which have been ignored by our deliberately crippled environmental review process. There is an LNG plant operating here already – and has been for many years. It is operated by what is now called Fortis BC, which used to be BC Gas. They developed an LNG program to reduce their storage costs. Gas gets produced year round but demand is heavily seasonal. They were also interested in developing new markets in an exercise called load spreading – for example using natural gas either in its compressed or liquid forms for transportation. Which is where I came in. As a policy analyst and transportation economist for the BC Ministry of Energy, Mines and Petroleum resources in the early 1990s I was lobbied by BC Gas to try to get CNG powered buses for BC Transit, and LNG for BC Ferries. The first did happen, the second didn’t. But CNG in transit had a very chequered history. The LNG plant is located at Tilbury on the Fraser estuary. One of the reasons the Port is so keen on getting rid of the tunnel is the potential to increase traffic on the river – including much larger LNG tankers for exports. People like Todd Stone have been denying this, but the evidence is overwhelming. But what that also means is that due diligence has not been done in assessing whether such a proposal is desirable at this location. I used to be a Fortis shareholder, as my financial advisor was very keen on their performance and its impact on my portfolio. We had a very interesting discussion about the meaning of the words “risk assessment” – particularly when it came to the expansion of the Tilbury terminal. I am indebted to Kevin Washbrook, who has been very diligent in researching this issue and bringing it to the attention of Fraser Voices – one of the groups opposing the tunnel replacement. That is another reason for the insertion of the map: the proximity of the terminal and the idea of very large LNG vessels passing under the bridge is a concern, but because of the way the way that all the proposals in the area are viewed as standalone and no cumulative assessment has been done, the concern is not now being addressed. Canada is way behind what is legally required in the US and not at all prepared for security or safety risks of building LNG terminals near coastal communities. The Wespac proposal on the Fraser River is particularly egregious. I don’t think there is any way it would be approved in the US. The comparison to security procedures in the Port of Boston is interesting. There a major bridge over the Tobin River is closed every time an LNG tanker transits underneath. 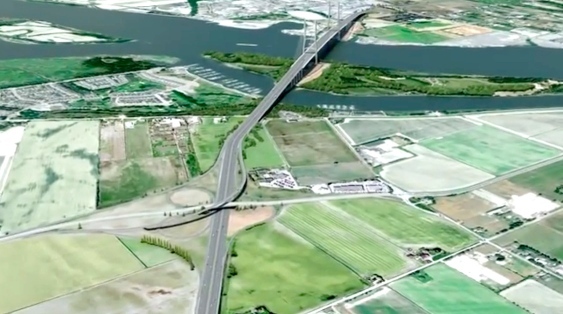 I don’t have any sense that the Province has considered this in their planning for the new 10 lane Fraser River crossing. Security closures during rush hour when LNG tankers are transiting the river? That won’t go down well. There is a full report as a pdf file. Part Five is a focused review of the Wespac proposal on the Fraser River and is of particular interest. The pursuit of an LNG export industry in British Columbia is taking place without the government oversight needed to protect the public from safety and security risks. US regulatory processes provide clear guidance on how to screen LNG proposals for these risks, and how to enforce security protocols around LNG facilities and tankers. Both are needed to protect communities and critical infrastructure from the risks posed by LNG. Similar regulatory processes could easily be established in Canada – if governments chose to make public safety and security a priority. • The BC Oil and Gas Commission, with authority over the permitting of coastal LNG facilities, does not explicitly require assessment of the risk of deliberate attack on those facilities, and excludes consideration of LNG tankers and marine approaches to proposed facilities from hazard identification and emergency planning processes. • Is this a safe place to build an LNG terminal? • Is this an appropriate waterway for the movement of LNG tankers? As a result, as project reviews gain momentum, there is valid concern that approval processes will attempt to mitigate risks through design requirements for projects that should have been rejected at the outset because they are poorly sited. The best way to manage security and safety risks around LNG development in BC is to avoid creating those risks in the first place. Canada and British Columbia need to establish transparent and well justified site selection and waterway suitability assessment processes for LNG export proposals to ensure we avoid these risks. A preliminary pre-screening process will be an important tool for eliminating poorly sited project proposals, and will save proponents and government time and money that would otherwise be spent in lengthy approval and permitting processes. Fortunately, the hard work of developing a pre-screening process has already taken place in the United States. Studies by Sandia National Laboratories have determined justifiable hazard planning distances for assessing risk posed by proposed LNG facilities and LNG tanker movements on nearby populations and critical infrastructure. The Sandia Laboratory findings have been incorporated into a comprehensive waterway suitability assessment process used by the US Coast Guard to screen LNG marine terminal proposals for safety and security risks. USCG waterway suitability findings from this process are used by the Federal Energy Regulatory Commission (the US agency in charge of LNG terminal approvals) in their decisions on LNG terminal proposals. Canada should look closely at existing US regulations – they provide a ready made and proven template for developing our own pre-screening process to protect the public from LNG risks during the process of LNG terminal site selection. However, even if government did develop a comprehensive pre-screening process, British Columbians would still face risks from LNG export projects. Our federal government has failed to establish a preparedness and response regime for ship-source incidents involving hazardous substances like LNG, despite long identifying such a regime as a priority. The LNG industry has not established a dedicated response organization such as the one in place to address oil spills. Coastal first responders are likely unprepared to deal with the serious hazards posed by a worst case incident involving loss of containment and fire on an LNG tanker. Canada has not established a regulatory regime for bunkering LNG–fuelled vessels, nor, apparently, a certification program for LNG bunker barges. Further, existing marine security regulations in Canada are underdeveloped and reactive. They do not incorporate, as normal operating procedure, moving exclusion zones around LNG tankers that are common practice in US ports. In addition, neither our Port Authorities nor LNG proponents themselves appear adequately resourced to enforce such exclusion zones if they were applied. While the probability of a deliberate attack or serious accident on an LNG tanker or facility may be low, the consequences for our communities or critical coastal infrastructure of such an attack could be catastrophic. Government has a responsibility to properly assess and prepare for these risks before BC exports LNG. Our governments have shown themselves to be keen supporters of development of an LNG export industry. However, before LNG exports proceed, they must show they are just as keen to protect public safety and security from the risks posed by that industry. BC and Canada should place a moratorium on approved and proposed LNG exports until key regulatory issues are addressed, including 1) developing a proper site screening and waterway suitability assessment process for evaluating LNG export proposals 2) establishing mandatory and enforceable security procedures to address the risk of deliberate attack on LNG facilities and tankers and 3) creating a robust preparedness and response regime for ship source incidents involving LNG, and ensuring that LNG bunkering is properly regulated and LNG bunker barges are properly certified. Will planting eelgrass help salmon? Port of Vancouver looking to plant eelgrass beds at Roberts Bank. So the Port of Vancouver says it will replace the eelgrass beds that they initially destroyed in 1970 when they built a un-bridged causeway over Roberts Bank and a 20 hectare (49 acre) manmade pod. They added another pod in 1983, and again in 2010. This makes it a problem nearly 50 years in the making. Further; all of this was done over the objections of a Federal Government report in March of 1979, called: “Report of the Environmental Assessment Panel; Roberts Bank Port Expansion” which stated and I quote; “The Panel recommends that approval for the full expansion as proposed not be granted”. This environmental destruction throughout Port of Vancouver history has been known for decades, but nothing has ever been done. Worse the report also notes that a large portion (80%) of the salmonid rearing grounds in the Fraser River Estuary has already been alienated and that any further losses should not be allowed. They concluded also that certain mitigation measures, such as eelgrass transplants, and provision of new habitat, have not been proven to be effective, and cannot be accepted as compensation for existing fisheries habitat. In 2010, the B.C. Government scientists reported their concerns about ongoing channel erosion between the Tsawwassen Ferry and Roberts Bank Port Terminals and claimed reports were “grossly incomplete” and their cumulative effects were being discounted. The Roberts Bank Port Expansion together with the Tsawwassen Ferry Terminal, have virtually destroyed the natural eelgrass beds by physically obstructing the natural flow of water and sediments. This in turn forced the migrating salmonoids away from the eelgrass shelter area and forced them to be exposed to the natural predatory fish in the Strait of Georgia, thus causing a high mortality rate. This mass destruction of fish stocks has never been investigated or studied by the Department of Fisheries & Oceans. Now in order to compensate for the loss of the salmonid and crab eelgrass, and marshland resulting from the construction of Terminal 2 at Roberts Bank, the Port of Vancouver in October of 2016, proposed to create 43 hectares of manmade eelgrass and marshland immediately north of Steveston’s south arm jetty, next to the Sturgeon Banks. Then on February the 13, 2017 they proposed to plant 4 hectares of eelgrass near the Tsawwassen Ferry Terminal, in an attempt to recreate the eelgrass that was lost over 50 years ago, when the ferry terminal was built. How important was this eelgrass system 50 years ago? “The Fraser River Estuary and associated transitional wetlands comprise of one of the most dynamic and productive ecosystems in Canada. The ecosystem supports a large and diverse community of organisms. We must not let these proposals of mitigation by the Port of Vancouver fool us into a false sense of security, by trying replace, or imitate eelgrass that was naturally created by an undisturbed flow of sediment down the mighty Fraser River. Perhaps they should remove the training walls they have installed all along the Lower Fraser River (Trifurcation) and allow the Fraser River to flow in its natural channel and carry and deposit the sediment to its natural destination along the river and create the marshlands and eelgrass beds at its mouth where it will create the most good. One cannot overstate the need for a full scale hydraulic model of the Fraser River Watershed be constructed, governed by an independent Agency that would determine what the cumulative affects each and every proposal would have on the Fraser River Estuary. In conclusion: If the Port of Vancouver is truly serious about retaining the Fraser River’s Ecosystem they should step back from their proposals to further expand Roberts Bank Port with Terminal 2, and stop advocating for the removal of the George Massey Tunnel and the dredging of the river deeper so they can industrialize the whole of the Lower Fraser River. After half a century, the destruction of the mighty Fraser River has to stop now while there is still something left to save. Submitted by: Douglas George Massey, Delta, B.C. With the help of dedicated friends. In fact, a review of the public consultations reveals that Mr. Harcourt’s comments do reflect public opinion which is strong opposition to the bridge. Of 446 written submissions, 22 offered comments without showing support or opposition to the planned bridge. Of the other 424 submissions, 96% expressed opposition to the bridge. Only 4% supported the bridge. There were three earlier consultation periods. The first phase (November-December, 2012)[v] sought information from the public on usage of the tunnel. 16 written submissions were thoughtful comments about transit, environment and integrated regional planning. Many urged retention of the existing tunnel. The second phase (March-April, 2013) offered 5 options but the feedback form did not provide opportunity for fair comment. The report of phase 2 claimed high support for a new bridge but there was no evidence to support the claim. The information provided at the Open Houses and meetings was incomplete. Facilitators told attendees that a bridge is cheaper than a tunnel but did not provide evidence. One facilitator told the public that “only 2% of respondents in Phase 1 wanted to keep the tunnel”. Many of the written submissions offered the same concerns as documented in the first phase. A number of written submissions opposed the bridge (21/47) while a small percentage expressed support (7/47). The Third Consultation Period (December, 2015-January, 2016) occurred after the announcement of the bridge. The results of this phase were documented in a report prepared by Lucent Quay Consulting. The Report documented numerous issues raised by the public. There was considerable concern about costs and tolls. VICTORIA: “The B.C. Liberals are claiming the latest round of public consultations has confirmed “strong public support” for their plan to replace the George Massey tunnel with a toll bridge. But the summary report on those consultations, released Wednesday, tells a different story. Those who commute through the often-congested tunnel on a daily basis likewise support the prospect of getting to and from work more quickly. But there was precious little support for the more controversial aspects of the project. Only 24 per cent of those responding via a publicly distributed feedback form made a point of saying they were “generally supportive” of the overall scope of the tunnel replacement plan. A further 31 per cent expressed conditional support for some aspects of the project as outlined on the feedback form. But that was far from constituting an unqualified endorsement for the plan to remove the existing tunnel, replace it with a high-level 10-lane bridge, and reconstruct adjacent connecting roads and intersections at a combined cost of $3.5 billion. Even more misleading was the government characterization of the survey’s findings on tolling. Most supporters of the bridge serve vested interests. The over-sized, over-priced bridge does not have public support. Will shaky soils kill the bridge? I am not an engineer or a geologist. But I do know that soil liquefaction is a huge problem for structures in earthquake prone areas, like the one we live in. When the shaking starts what seemed to be solid ground is actually waterlogged sands and similar material – the result of millennia of silt being deposited by the Fraser River as it slows on its way to the sea – starts to move. The damage to buildings in San Francisco in its famous quake was due to similar soil conditions. They still cause issues there: a high rise called Millennium has piles that do not reach bedrock and it is both sinking and leaning. When the Massey crossing was first contemplated it was these soil conditions that caused the engineers to reject the idea of a bridge and chose a tunnel instead. Those conditions have not changed since. The Geological Survey of Canada in 1995 reported that bedrock is around 1,970 to 2,300 feet below where the new bridge is proposed. More recently B.C. Ministry of Transportation and Infrastructure had two holes bored to 1,099 feet “without tagging bedrock” – not really a surprise since there was another 1,000 feet to go. We know that Greater Vancouver is going to experience a major earthquake since there has not been a major shift in the tectonic plates since European settlement started, but there was apparently a “big one” which was recorded as a tsunami that hit Japan. These events are hard to predict with any accuracy but many seismologists think it is “overdue”. No-one has ever built a cable stayed bridge of this size in these kind of conditions. Indeed it is very hard to think of why anyone would propose taking such a risk – anyone who has the imagination to envisage what happens to two massive towers unsecured to bedrock but linked by cables and a bridge deck when the soil beneath them liquefies and shakes. “I think people tend to focus on the Big One. If you’re looking at the statistics there’s a one in 10 chance that it will happen within the next 50 years. I think of those as fairly high odds. If we had a lottery with that kind of probability you’d probably buy a ticket,” she said. Ask yourself, as Premier Christy Clark wants you to buy a bridge, do you feel lucky? 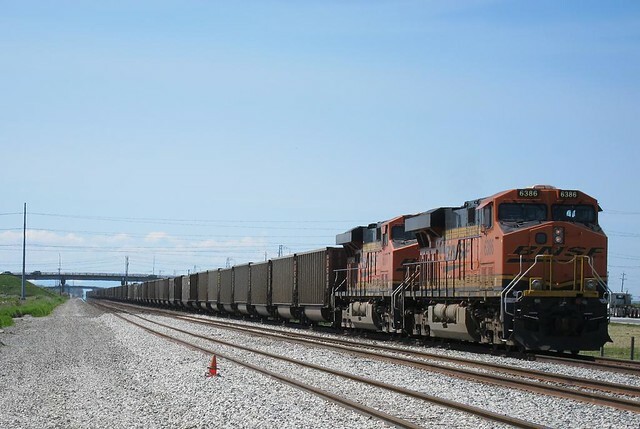 You probably know already that proposals to expand coal exports at several ports in the United States have failed to get the necessary local approvals. Unfortunately, in Canada, we do not have local control of the ports like they do down there. Here the port is a federal concern, and under Stephen Harper they got used to doing pretty much whatever they wanted. The ports in Canada are actually controlled by the industries and companies that use them and hence they are immune – to a large extent – from concerns expressed by the people who live next door. Except that there are some remaining powers, which under the new Liberal government may actually have some force. provided that Justin actually keeps all those promises he made before the election. Case in point is the idea that Fraser Surrey docks could be used by BNSF to load thermal coal from the US Powder River Basin for export to power stations in Asia. Given that the size of ships that can navigate the Fraser are currently limited by the depth of water over the Massey Tunnel and the headroom under the Alex Fraser bridge, the idea is to use barges to tranship the coal from the railhead in Surrey to Texada Island where a new, deep water ship terminal would be built. The desperation of the coal exporters willingness to even consider this kind of expense is borne out of two considerations: the market for thermal coal is shrinking, and the US federal government is beginning to wonder why it is giving away coal at knockdown prices from public lands. Given the endorsement of the Paris Agreement by the US and China, the days of expanding coal fired generation of electricity are clearly numbered. Together with the plummeting price of both solar and wind power, and ways to cheaply store that. Yesterday, regional bureaucrats approved a wastewater permit for the Fraser Surrey Docks coal export proposal, moving this climate-killing megaproject one step closer to construction. This is our chance to stop millions of tonnes of U.S. thermal coal from slipping out through the Lower Mainland to be burned in Asia. Metro Vancouver must now consider whether to issue an air quality permit that would allow Fraser Surrey Docks to pollute our lungs and our communities with coal dust and diesel fumes. The good thing is Metro’s board is made up of elected local politicians — accountable to you. They’re on the record against any expansion of coal exports on the Fraser River, and they have the power to put the brakes on Fraser Surrey Docks. If enough people speak up, we can empower Metro Vancouver to protect our communities and our climate. Will you take two minutes to write to the Metro Vancouver Board and ask them to stand firm in their opposition of Fraser Surrey Docks? With prices collapsing and coal projects being cancelled around the world, this delay could be enough to permanently end the threat of an expanded coal port. In the past five years, seven thermal coal export proposals have already been stopped in the U.S. The tide is turning against coal, and we need the elected members of the Metro Vancouver Board to show real leadership by saying ‘no’ to Fraser Surrey Docks. We’ve made it quick and convenient, so please take a couple minutes to write to them right now. We can stop this project, but not without you. Please take action today. P.S. In 2015, there was so much public interest in the wastewater permit that Metro Vancouver offered a public consultation period for the first time. An unprecedented number of local residents voiced health, safety and environmental concerns about the management plan for wastewater at the coal port expansion. It set the project back by a year. Now the real fight over the air permit begins. Will you be one of the people willing to stand up and speak out? Across the west coast of the United States, communities have stood up against the expansion of coal export facilities. Quite apart from the immorality of increasing fossil fuel exports at a time when our climate is nearing the limits of what it can cope with and remain livable, these communities raised real concerns about the impacts of coal dust on the local population. Carrying pulverised coal in open rail cars at speed spreads fine dust over a wide area. We already see this in Greater Vancouver due to current coal export movement. We also see that the supposed mitigation measures offered by the railway and terminal operating companies are worthless. Metro Vancouver Board members ought to be concerned about climate change and the very doubtful economics of coal exports, but sadly you have no legal ability to act on those concerns. You do however have the opportunity to prevent more damage to our health and the environment. The existing coal export operations show how careless these operations are, and how weak our control systems have been. We simply cannot afford to be so reckless with human health any more. You must refuse the air quality permit given the shameful performance of these operations to date. Thank you for contacting our office, your message has been received. Please note, staff will look into your correspondence and follow up as soon as possible. To report a City Service related problem or time sensitive matter, please visit www.surrey.ca to connect with the appropriate department. While the Sewage Control Manager did issued a liquid waste discharge permit to Fraser Surrey Docks on September 6, 2016 in relation to their proposed coal transfer facility, it continues to be Metro Vancouver’s position that before the facility can operate it must also obtain an air quality permit and Metro Vancouver has not yet received an Air Quality permit application. This position of requiring an Air Quality permit is not without opposition from the proponent, as the facility is on federal land and there is a potential constitutional issue of jurisdiction. The Sewage Control Manager is directed by GVS&DD Sewer Use Bylaw No. 299 2007, to independently evaluate applications based on technical merit and in accordance with bylaws and the BC Environmental Management Act. When the technical criteria are met, the Sewage Control Manager is required to issue a Liquid Waste Discharge Permit. Had the Sewage Control Manager rejected the permit application, FSD could have moved forward with other wastewater control measures, including applying to the province for a permit to direct discharge to the Fraser River. To be clear, the issued permit is very narrow in scope and only allows for storm water runoff and wastewater from activities like dust mitigation and equipment wash-down from the potential FSD facility to be discharged to the Annacis Wastewater Treatment Plant. Thanks for your email. Surrey City Council stands opposed to the coal export terminal and has passed a resolution to that effect. Furthermore, with the price of thermal coal, it is highly unlikely that the proposed export terminal and the transportation from the US will make economic sense for the foreseeable future. Thank you for your concern in this matter. Wouldn’t you like to add your thoughts to this process: not as a comment to this post (though a copy here would be interesting) but your own thoughts: it seems that the Metro Board is actually listening.